Since we hit "ok," our location showed up as a neighborhood in our "path." After tapping the neighborhood entry, we got a Google Map showing our exact location with a blue dot [ see screen shot below ]. In fact, you can see the precise location of any of your Path friends -- err, loved ones -- as long as they have hit the same "ok" button and have not changed their settings. 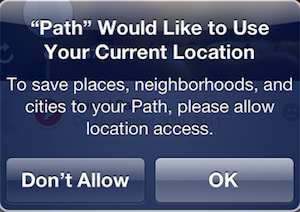 We love and trust Path (more on trust in a moment), but this kind of opting in makes us think of Facebook. Mark Zuckerberg got in trouble with the Federal Trade Commission over privacy promises broken, and just yesterday Facebook settled with the FTC. We're wondering why Path -- which is all about privacy -- was not more clear about its "Automatic" feature. Dave tells LAUNCH, "The feature is entirely opt-in. If you feel that the experience is unclear, we'll certainly work to make it more clear. We've tried to make it very simple and clear with one dialog. Would love your feedback." "Your trust in Path has also motivated us to build a new feature we call Automatic. This amazing new feature enables Path to learn about you as you go about your daily routine. You can optionally choose to have your Path updated with stories about your life—automatically. 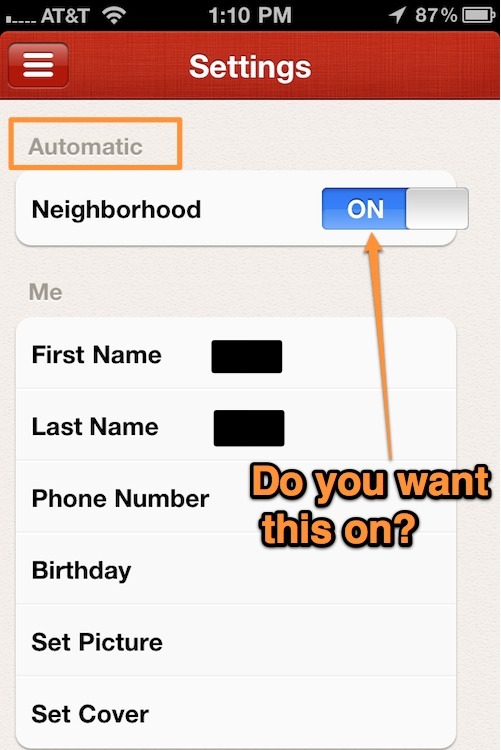 For example, Path updates whenever you spend time in a new neighborhood. Or, if you travel to a new city, Path lets your loved ones know. Path is now a journal that writes itself. Less effort from you, more stories in your Path." We think the language in the permission pop-up box should say "share" and not "save" -- and we've told Dave just that. We wouldn't want to see Path lose the trust of its 1M (and growing) users. If you've agreed to share location information with friends on Path, you'll be happy to know that Path is NOT checking your location in the background -- that quickly drains the battery and "degrades" the iPhone experience, Dave says. If you use the app in the same place every day, like your office or home, Path will figure that out and not automatically update your status. "Path learns about your routine and figures out if you break out of the pattern. Additionally, if you are traveling we take into account things like velocity and a few other things to make sure that it is not noisy," explains Dave. "It took us several months to tune it in order to make it useful, not noisy, information. You can imagine driving in a car in LA or SF would cause quite a bit of noise. So, we've tried to reduce that and we think we've come to a decent place. We'll of course continue to improve it over time." The original Path app launched for the iPhone a year ago with photo-sharing limited to 50 people. Path added video sharing in February and Instagram-style lenses in March. The Android app launched in June. Path quietly increased the sharing limit to 150 people over the summer, with Dave telling LAUNCH then, "Moving to 150 gives users control and still allows for a high-quality network -- highly noted anthropologist Robert Dunbar pinpointed this range of 50-150." Path has received more than $11.2M total from investors including Kleiner Perkins -- which gave Path $8.5M in February -- Index, First Round Capital and Founders Fund.